The question of camera bags pops up quite frequently on outdoors forums. I have a dislike of camera bags of any kind. They are heavy, bulky and usually over-designed. Camera equipment does need some protection from the elements, but I am completely unconvinced that cameras need to be cossetted in padded bags. 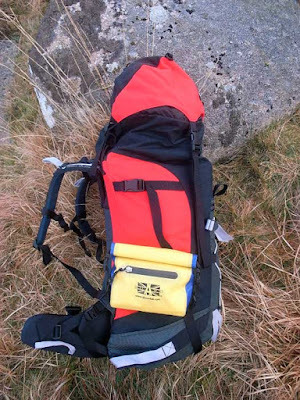 I generally use lightweight Exped drybags of varying sizes and colours to indicate what they contain. Even my large Fuji GX617 lives in a drybag inside my rucksack. One great advantage of using drybags is that the bag can be slipped over the camera and lens when mounted on the tripod to protect delicate equipment from rain, sleet, snow and mist. If I am carrying my Nikon around my neck as I sometimes do, It's very convenient to clip a drybag over it for weather protection. A couple of years ago I was at the Canoe Expo exhibition in Coventry and I came across this company. 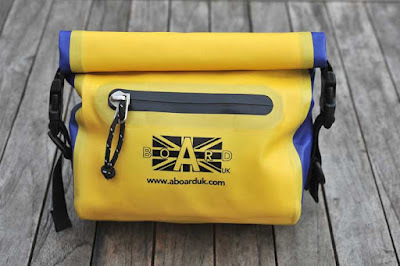 AboardUK Marine Equipment are based in Cornwall and make some useful waterproof bags for sailors and surfers. 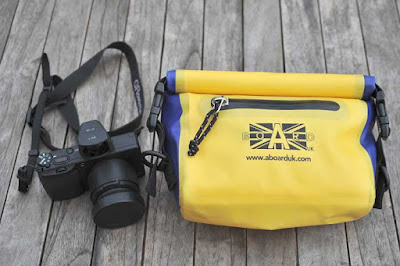 This little 'Horizon' roll-top bag is ideal for carrying a compact camera and assorted bits and pieces. There is a zipped pocket on the front to hold SD cards and spare battery. It comes with a waistbelt, which I have removed. 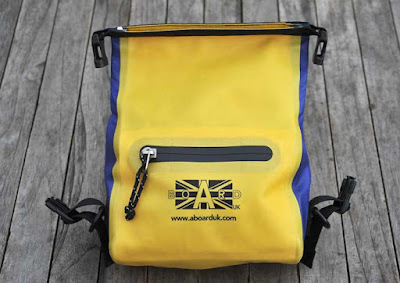 I carry it by threading a rucksack compression strap through the belt loops on the bag. It's been out in all weathers and has never leaked, although I wouldn't advise total immersion. Cost about £25. I found you from the OBS. Beautiful pictures! Thanks for dropping by and your kind comment, THW!